Darby Toth with some of her winnings as a speech and debate student at Fort Scott High School. 2018 Fort Scott High School graduate Darby Toth is a National Speech and Debate Student of the Year nominee, she was notified last week. Toth has qualified all four years of high school to attend the National Speech and Debate Tournament in Florida, this year June 15-23. But this year she is one of five finalists for National Speech and Debate Student of the Year. While at the national tournament this year, Toth will interview with selected debate coaches to find out her placement. The honor is a dream come true, she said. 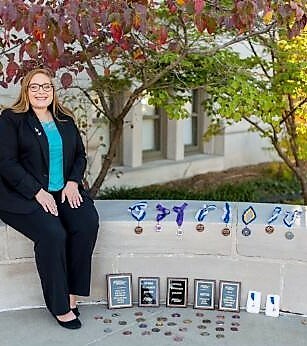 Two of the speech and debate coaches are her parents, both teachers at the high school. Amber Toth taught debate, forensic and speech, Travis Toth teaches history. It has become one of her passions, she said. Speech and debate have had “amazing” effects on her and has allowed her to follow her other passion: social justice, Darby said. Through her high school years, Darby has honed her communication and goal-setting skills learned in speech and debate. She helped organize a formal dress drive at her school as a sophomore. “We got winter formal (dress) donations for anyone who couldn’t afford it,” she said. Following Hurricane Harvey’s devastation of south-east Texas, Darby used the skills to help raise almost $5,000 for schools in Texas, she said. She took it upon herself to start a sexual harassment awareness campaign when she learned that issue was a problem for some students at FSHS. “It was definitely a challenge to get students, administration, and teachers on board,” she said. “It took a pretty detailed mapping of a plan…..they plan next year to have a sexual harassment awareness speaker come speak to the entire student body. We have several posters up around the school. Our counselors are more aware that it is an issue in our school and are working with the students. “There were some kids who were not being appropriate in the classroom, physically,…they faced repercussions for what they did. This topic includes focusing on the reasoning behind student actions, then mediating and working through it, she said. The AXA Achievement Scholarship is awarded to students because they have demonstrated ambition and self-drive. Darby received other recognitions as well. She had a 4.0 Grade Point Average at FSHS in mostly honors classes and received an Ellis Foundation Grant, Peterson Scholarship, Garvey Scholarship, a Kansas Honor Scholar among others. Darby is a four-time Speech and Debate National Qualifier, District Top Point Earner for two years, state champion in oration, state runner-up in impromptu speaking, number one debater/forensicator in Kansas, District Student of the Year, ranked in the top ten nationally, and recipient of the Debate and Forensics Scholarship-chosen by a panel of teachers. Toth will attend Washburn University with a psychology major and leadership minor in the fall.